Following up with our previous blog about tooth art here is another pair of artists who have used teeth as their inspiration. 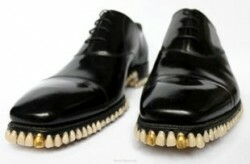 They have created a pair of men’s shoes using denture teeth for the soles. With all these stories coming out about teeth art you have to wonder, are teeth the new cool artsy trend? Will teeth become the new fashion accessory? If you are looking for a dentist to accessorize your mouth with porcelain veneers in Lynnwood, you’ve found it. Dr. Nichole Martin has made over many happy patients who love to show off their teeth in their mouth, not on their shoes.